Retail $55.98 SAVE 24% ! Simple connections - no special tools needed. For realistic operation of HO and N scale gauge train sets. 300 degree speed control gives throttle extended range for three times the control arc of ordinary power packs. Delivers superior slow speed operation, smooth acceleration, and increased railroad realism. Heavy duty construction for long lasting power. 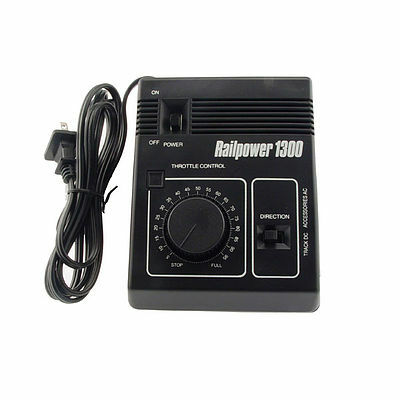 "Great for a simple layout or for a small part of a larger"
This works great and can power multiple engines on the same track at once a must have for young railroaders. I have one of these for my dual cab DC controlled HO layout and the performance in the trains I run is perfect. The smooth operations of all my locomotives is very important and it creates a sense of realistic operations. I highly recommend this to anyone starting out in the hobby as well as old hands. As with all electrical products, precautions should be observed during handling and use to prevent electric shock.